How should I understand Rabbeinu Bachya on Numbers 25:13? ויכפר על בני ישראל, “he obtained atonement for the Children of Israel.” This verse teaches that he who spills the blood of the wicked is considered as if he had offered a sacrifice. The idea is reflected in Exodus 21,14: “from My altar you shall remove him to die.” The meaning of the verse is that even if the party concerned is a priest involved in performing his priestly duties on the altar, he must be removed and executed (Yuma 85). How should I interpret the above? Certainly Rabbeinu Bachya cannot be condoning killing people. There are certain cases in which it is appropriate to kill someone, and certain cased in which killing is inappropriate. Typically appropriate killing would be legal executions. For discussion of when extrajudicial killing is justified see here. The quote doesn't say anything about which cases are which. Rather, it says that killing certain people is considered a great sacrifice. Presumably this refers to those people whom it is obligatory to kill. Indeed, the case at hand is one of the few cases in which killing may be justified (see the link). Also noteworthy in context is that as with most rabbinic quotes, they say more about the individuals saying them, then Judaism as a whole. This quote, for example, is rather obscure. Searching through a database of thousands books (Bar Ilan Responsa project version 23), yields just 11 results. It is therefore hard to clarify "the Jewish approach to it", given that it is an obscure statement without much clarification. We can, however, clarify which cases warrant extrajudicial killings, and which do not. The above link shows the limits of extrajudicial killing. Indeed, statements about the value of human life, even the value of the lives of the wicked, are much easier to find in Jewish literature. For example, Man is created in the image of God (Genesis 1:27). Additionally, even the bodies of executed criminals must be treated with certain dignity (Deuteronomy 21:22-3). The Talmud recounts that the angels wanted to praise God for destroying the Egyptians in the Sea of Reeds, but God angrily retorted: "My creations are drowning in the sea, and you want to sing praise?!" (Megillah 10b, Sanhedrin 39b). Additionally, the Mishna (Makkot 1:10) quotes R. Elazar ben Azarya as stating that a court that executes someone every seventy years is considered violent. R. Tarfon and R. Akiva say that if they were on the court no one would ever be executed. And speaking of the spilled blood of the wicked, the Mishna states that God mourns the spilled blood of the wicked (Sanhedrin 6:5, quoted in Hagiga 15b and Sanhedrin 46a). The quote in question need not necessarily contradict these classical Jewish sources (although it does unquestionably have a different tone). 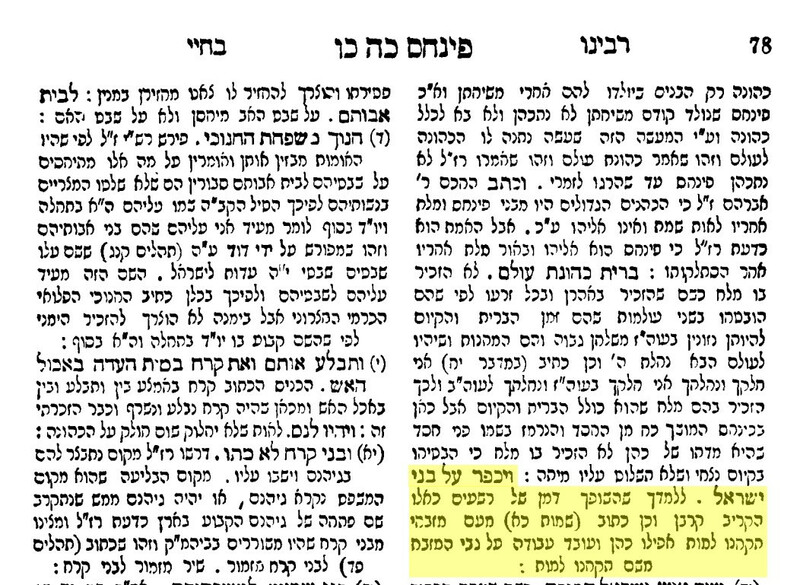 Indeed, Rabbenu Bahya himself references the teaching of Sanhedrin (6:5) in his commentary to Deut. (21:23). There are unquestionably cases in which someone must be killed. That in those cases, carrying out this deed is meritorious, doesn't seem so problematic. There are cases where a community is punished for standing by when evil is committed. We are obligated to prevent it -- hopefully through rebuke or reconciliation (tokhachah) before the crime or sin, or by preventing a repeat, or by setting an example of one person so that the enormity of the offense is driven home. A community that does not execute those they know deserve it share in the sin. So, by killing the guilty, the city avoids that guilt. Thus there is a parallel to an atonement offering, which also erases culpability. Actual capital punishment is rare in Jewish Law because certainty that there is evil is hard to come by. So that one would be obligated to fulfill "ובארת הרעה מקרבך -- and you shall burn out the evil from your midst" (Devarim 17:7) or its Noachide equivalent in theory, and that's the value system. But there is a competing value of "הוי דן את כל אדם לכף זכות -- judge all people on the side of merit" (Avos 1:6) and to treat other Jews as having a "חזכת כשרות -- a presumption of innocense" that more often outweighs this value. And from this point, I would refer to to Al Berko's answer. Rabinu Bechaye holds an opinion that "spilling the blood of the wicked is considered as if he had offered a sacrifice". Nothing more. This is his book of interpretations, not Halakhic statements. He's allowed to hold any views whether they are accepted or rejected by other interpreters. Rabeynu Bechaye holds, that theoretically there can be a situation where an intentional murder of a Rasha is favorable in G-d's eyes on par with sacrifices. To practical implementations of this interpretation, the accepted approach to Rashoim is what's ruled in Brochos 10a, the story of Beruria, that said "Let the sins be consumed from the earth, and the wicked shall be no more" (Psalms 104:35), we should try make the Rashoim repent. If not possible, the closest to R"B is what's ruled in Avoda Zorah 26b - "מורידים ולא מעלים" - we cause to take them down and not help them out. And this can only be made by a ruling of a Beis Din. Not the answer you're looking for? Browse other questions tagged hashkafah-philosophy korban quotations evil-resha bamidbar-numbers-book-of . How exactly should I understand the Divine Presence? How should a shul determine its hashkafa? HaSatan how should it be described? How Does Ramban Understand Verse in Psalms About God's Pride?